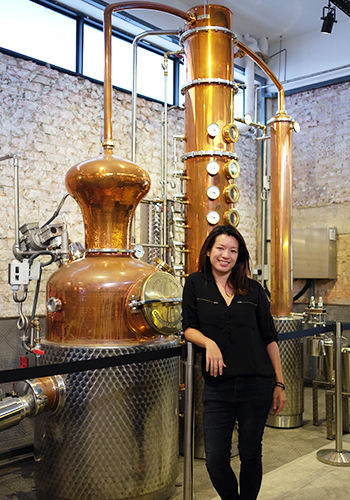 Six years ago when Jamie Koh opened her first F&B business and found that there was not a single spirit brand from Singapore, she set a goal to create one in the country. She started with taking a distilling course in the United States to study the theoretical knowledge of distillation, then interning in distilleries there, in the United Kingdom and Germany (Black Forest) while juggling between her two F&B businesses. Working in big and small scale distilleries that use modern to very old technology equipped Koh with an understanding of the whole spectrum of the distillery business. With a recipe and concept that she already had in mind, Koh packed a suitcase full of local botanicals and jetted off to Germany. She met with a master distiller there, who himself was a farmer. Having not seen some of the botanicals which are unique to South East Asia, he had Koh distil each ingredient on its own in order to extract the flavour profile individually. From that, they had to come up with a recipe that represents what Koh had in mind for a Singapore Gin. 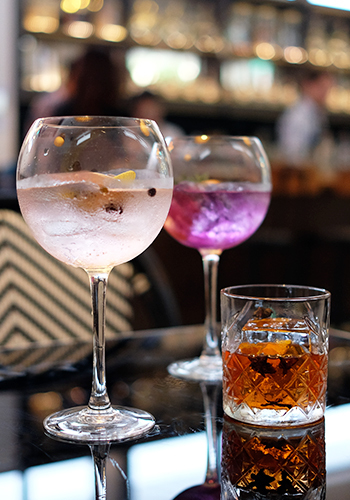 A typical London Dry gin is distinctly juniper forward and strong with spiciness, which may be suitable for the British weather but not so much for the hot climate in South East Asia. The goal was to create a tropical gin that is citrusy with refreshing floral notes, which would be perfect for humid Singapore. It took months of experiments and several iterations to finally put together what is now the Brass Lion Singapore Dry Gin. 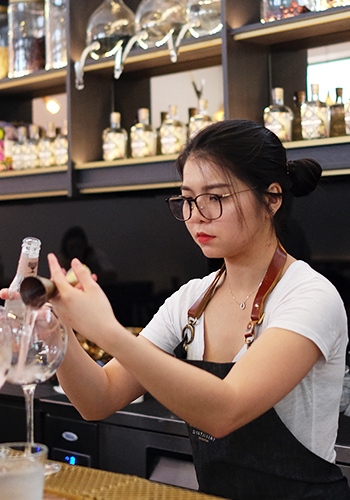 “All the ingredients in the gin can be purchased within a five-kilometre radius from the distillery, such as the local Traditional Chinese Medicine shops, the Pasir Panjang wholesale market or the distillery’s herb garden at the back, except for the juniper berries which are from Macedonia,” revealed Koh. 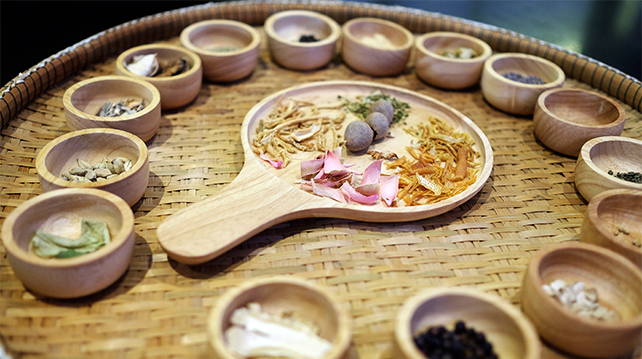 There are 22 botanicals including chrysanthemum flowers, lavender, angelica root (dang gwei), kaffir lime leaves, lemon grass, mandarin peel, galangal, pomelo peel, torch ginger flower and tamarind. Koh explained that the Brass Lion Singapore Dry Gin is in between a London Dry and what some call a new age gin, being distilled in the same tradition as London Dry but less juniper forward and more experimental. The Butterfly Pea Gin, which is a blend of the Singapore Dry with butterfly pea flowers and lavender, is a beautiful blue that turns pink when it comes in contact with citrus. Watch out for Gin Pahit, their house bitters which will be launched soon (as we’re told!). Barrel Aged and Navy Strength Gins are are also in the pipeline. 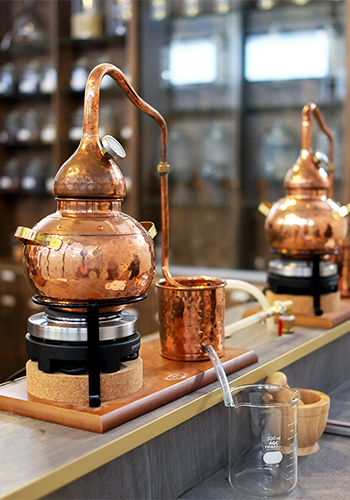 Nala, the custom-made 150-litre copper pot still from Germany, is the biggest fixture in the building. In general, a maximum of three plates are sufficient to produce gin but the distillery had planned from the start to produce more than one type of spirit, hence the installation of the 5-plate column still. The adjacent room is where Brass Lion’s gins bottling and labelling happens, all done by hand. The liquid is taxable as soon as it leaves these two rooms, therefore not a drop is allowed to be consumed here. However, the tasting room and house bar is one floor up and open to the public until midnight daily. Head bartender Shewei Lee makes some mean drinks. The distillery tour is available only on the weekends. Make sure to book a slot ahead of time and ask also for the next Gin School schedule to make your own customised gin.